Traditional Italian rustic style home for sale in Piedmont. 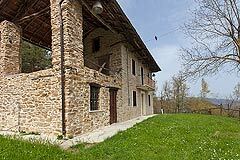 Niella Belbo Langhe Hills (ref: 6680)- Charming Langhe stone farmhouse nestling in the heart of the Piemonte countryside. Very tranquil location.. Piedmont Properties in Piemonte. Property for sale Langhe and Piemonte. Map for Property ref: 6680, Traditional Italian rustic style home for sale in Piedmont. - Charming Langhe stone farmhouse nestling in the heart of the Piemonte countryside. Very tranquil location.